Israel and its supporters were shocked by a recent report which qualified the Jewish state as the one with the highest poverty rate among all OECD nations. 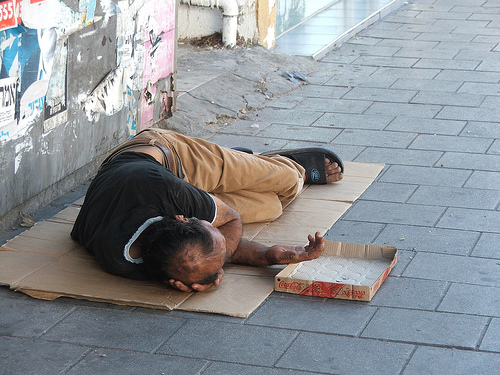 Poverty in Israel is however not a shared reality for all, instead it is very much concentrated in certain sectors of society, particularly among Ultra-orthodox Jews, as well as Palestinians with Israeli citizenship. 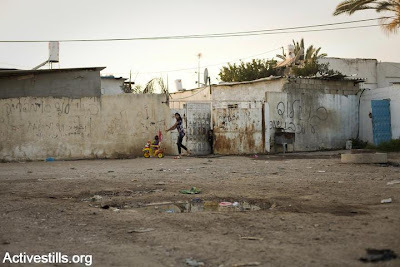 The reasons for the high poverty levels among those two groups are very different, and in the case of the latter can be clearly traced back to the general discrimination and marginalisation that the Arab minority has been facing on basically all levels of public life since the foundation of the Jewish State. Palestinian citizens of Israel, usually falsely referred to as "Israeli Arabs", a term which intentionally undermines their distinct Palestinian identity, are those Palestinians who remained in their homeland after the establishment of the State of Israel in 1948. They constitute more than 20% of the total Israeli population and number more than 1,2 million people, including Muslims, Christians and Druze. "dispossess Arab citizens of Israel and exclude them from the land; turn their citizenship from a right into a conditional privilege; limit the ability of Arab citizens and their parliamentary representatives to participate in the political life of the country; criminalize political acts or speech that question the Jewish or Zionist nature of the state; and privilege Jewish citizens in the allocation of state resources." Over half of the Palestinian families with Israeli citizenship are classified as poor and in 2008 accounted for 44,5% of all poor in Israel. This inequality results from huge income disparities between Jewish and Palestinian citizens, where the average gross monthly income among Arab male workers is around 42% lower than that for Jewish male workers and the net income of Palestinian households constitutes only 63% of the net monthly income of Jewish households. Unsurprisingly Palestinian citizens of Israel are also over-represented among the unemployed in Israel and usually exceed the overall rate. According to recent statistics by the Central Bureau of Statistics, the share of Palestinians with Israeli citizenship among all unemployed Israelis is at around 30%. This is unquestionably connected to the discrimination that Palestinians with Israeli citizenship face on the job market. According to Adalah, Jewish Israeli women spend on average 31 weeks looking for a job, while Palestinian women search 64 weeks, thus more than double of the time. As a consequence of the systematic multiple discrimination that Palestinian women face on the job market, only 21,1% hold jobs, as compared to 57% Jewish women. The convenient explanation of "cultural factors" determining the low employment rates of Palestinian women does not hold, as the employment rate of women in other Arabic countries, such as Qatar, Jordan, Egypt, and Lebanon is significantly higher than in Israel and Palestinian women in Israel continously express their desire to work. While many individual Jewish employers can be hold responsible for the discrimination that Palestinians face on the job market, the State of Israel, both as the largest employer and through its discriminatory legislations, makes it increasingly hard for Palestinian job seekers. For example, many offers on the labour market require alleged military experience although the actual nature of the work does not demand any such skills. Since Palestinian citizens of Israel are (still) exempt from the compulsory military service they are automatically excluded from those jobs. The discrimination on the labour market is cross cutting through the whole Palestinian population in Israel and also affects those with academic degrees, as 40% of Palestinian academic graduates cannot find work in their own professions. The state further does very little to create job opportunities for Palestinians with Israeli citizenships as it typically concentrates industrial zones in Jewish majority areas. The Israeli government in general invests much less resources in the development of areas with large numbers of Palestinian citizens and the socio-economic status of the 75 local Arab authorities is much lower than that of Jewish local authorities. The unequal redistribution of resources and social welfare obviously also affects other areas, such as education and health, which in turn affects the economic situation of Palestinians with Israeli citizenship. The government reportedly provides on average three times as much funding to Jewish students as to Arab pupils, a notion which will most likely sustain the income gaps between the Jewish majority and the Arab minority in the future. Considering that according to statistics Palestinians with Israeli citizenship will constitute 25% of Israel's population by 2025, and that their under-employment already translates into a potential loss of NIS 31 billion to the country's GNP, one has to wonder how the government is planning to maintain its economy if it keeps on systematically discriminating against such a large segment of its population. j live in France where there are many Algerian arab with French Passeport. But J think like you they must be Algerian in France; like Palestinian in Israel.